"The sophisticated and vibrant city of JUNEAU is the only state capital in the nation not accessible by road. It is exceptionally picturesque, wedged between the Gastineau Channel and the rainforested hills behind. In 1880, Joe Juneau made Alaska’s first gold strike here, and until the last mine closed in 1944 this was the world’s largest producer of low-grade ore – all the flat land in Juneau, stretching from downtown to the airport, is waste rock from the mines. "Juneau is a capital of contrasts and conflicts. It borders a waterway that never freezes but lies beneath an ice field that never melts. It was the first community in the Southeast to slap a head tax on cruise-ship passengers but still draws more than a million a year. It’s the state capital but since the 1980s Alaskans have been trying to move it. It doesn’t have any roads that go anywhere, but half its residents and its mayor opposed a plan to build one that would. "In 1906, gold rush pioneer John Olds built one of the grandest homes in all of Juneau, high on the hillside, overlooking the town and its bustling waterfront. 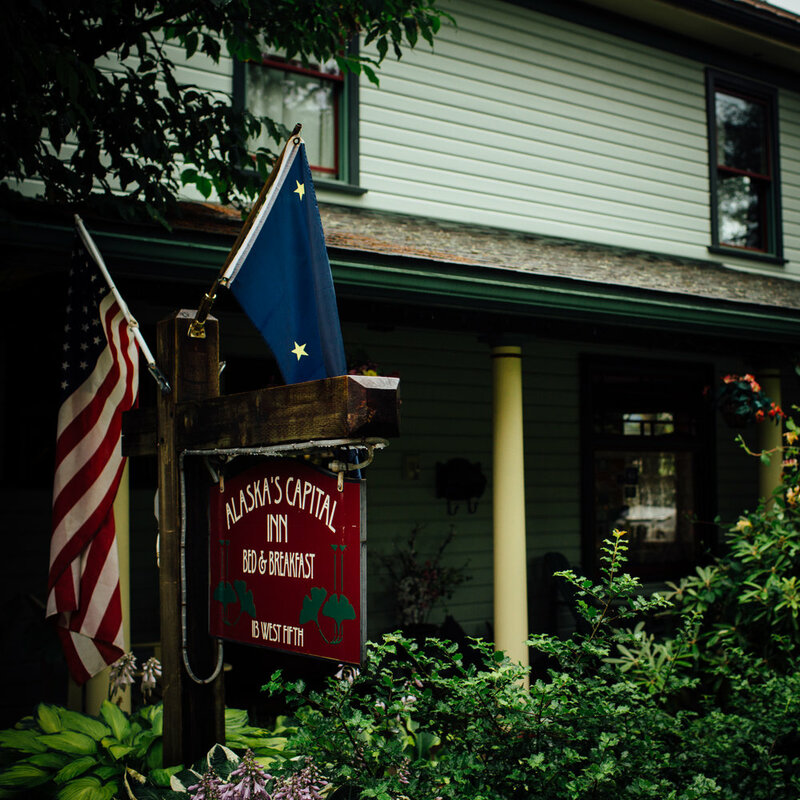 Painstakingly restored over a four year period to its original grandeur, the Inn now blends turn of the century elegance with all the contemporary comforts of home. Furnished in period antiques and fine reproductions, your senses are reminded of an earlier time and the Inn's place in history and the town's rush for gold." The Capital Inn is Confluence Strategies' home away from home. "Centrally located in downtown Juneau, the historic Westmark Baranof Hotel was built in 1939 and stands out among all hotels in Alaska’s state capital. Just steps from Juneau’s waterfront, cruise ship docks, boutique shopping, the State Capitol building and government offices, the Westmark Baranof Hotel offers premier accommodations for the business or leisure traveler." With a past as storied as the state's capital, the Baranof Hotel is practically an institution of its own. "Four Points by Sheraton Juneau is located in the heart of Historic Downtown Juneau, just steps from the Seadrome Marina, the waterfront, and more. A preferred hotel of the Centennial Hall Convention Center, the Four Points is conveniently located near the top things to do in Juneau. As close to the waterfront action as you can get, including the only glacier within city limits in the whole country."